We’re J.J. Fad and we’re here to rock. In case you weren’t into female hip-hop bands in the late 80’s, and I can’t imagine who wouldn’t be, Supersonic was the first rap song I ever knew all the words to and remains, in my esteem, one of the dopest tracks ever laid down. I tried to embed the video so you could enjoy the vocal stylings of MC J.B., Baby-D and Sassy C (and don’t forget DJ Train – mixin’ and scratchin’ is the name of the game) but wordpress wants me to pay $60 to do that. Which is dumb. So click the link above for your free jam of the day. Now I wish this were a posting about jam. But it’s not, I don’t make jam – I make soup. And that’s why it’s soupersonic, obviously. So, there are some people in my household (ahem, not the pug) that don’t like soup that isn’t pureed. I don’t get it – he won’t eat a broth with noodles and meat in it – he’s a bisque, nay, potage, sort of guy and so when I’m in the mood for soup there are only a couple go-tos and this is one of them. Preheat your oven to 425°F. 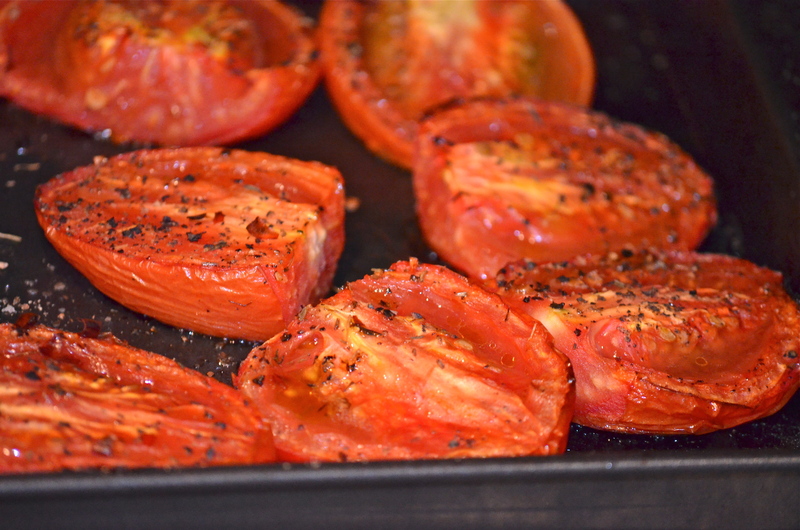 Rinse and slice your tomatoes long-ways and put them in one layer on a sheet pan. 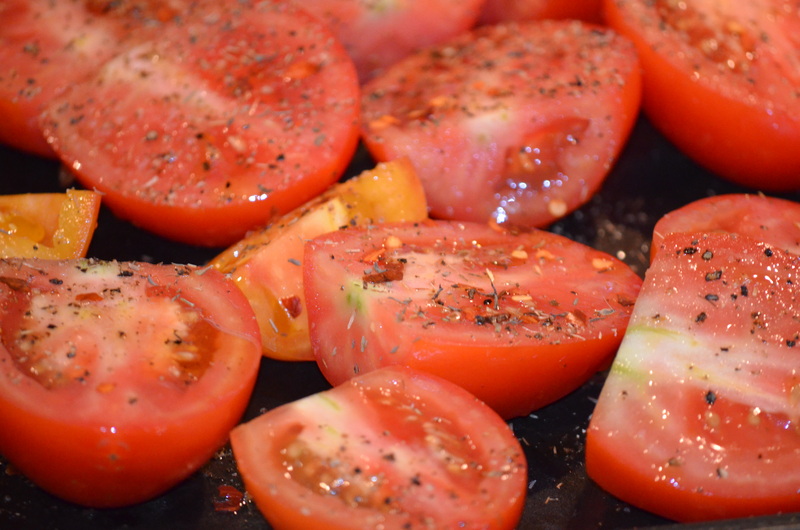 Drizzle with olive oil, salt and pepper and the dried thyme if that’s what you’re using. If you’re using fresh thyme, wait to put it in with the soup later. That cute little yellowish tomato in there is a Mr. Stripey (that’s really the name of the tomato variety which I find adorable) from our garden. It’s the only one we were able to salvage all summer since the squirrels decided to eat all of our tomatoes. I dislike squirrels passionately. While those are roasting, you can start on the soup on the stove. Heat a tablespoon or so of olive oil in a large dutch oven over just north of medium heat and sauté the onions until they begin to get a bit of color on them – about 8 minutes. Add the garlic and cook that for only about a minute. Add the two large cans of tomatoes, the basil, the thyme sprigs if you’re using them and the chicken stock and let simmer while the roasted tomatoes finish. 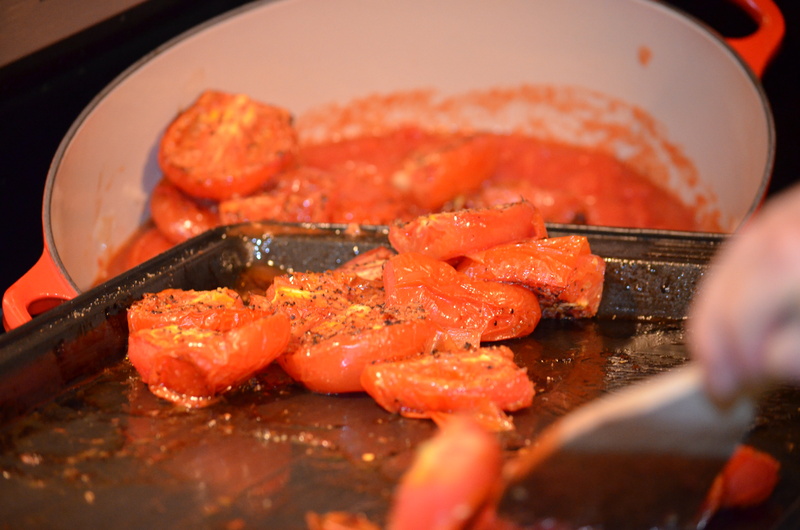 Once they’re done, add the roasted tomatoes to the soup base and cook for another 20 minutes or so. Here’s where it gets fun/messy. I have learned the hard way how to puree/blend something hot without getting whatever it is you’re cooking on your walls. It wasn’t easy, but I did it and I’m a better person for it. We puree this and then put it through a sieve or chinois to get rid of any leftover bits of seeds or tomato skin. You can do this or not. 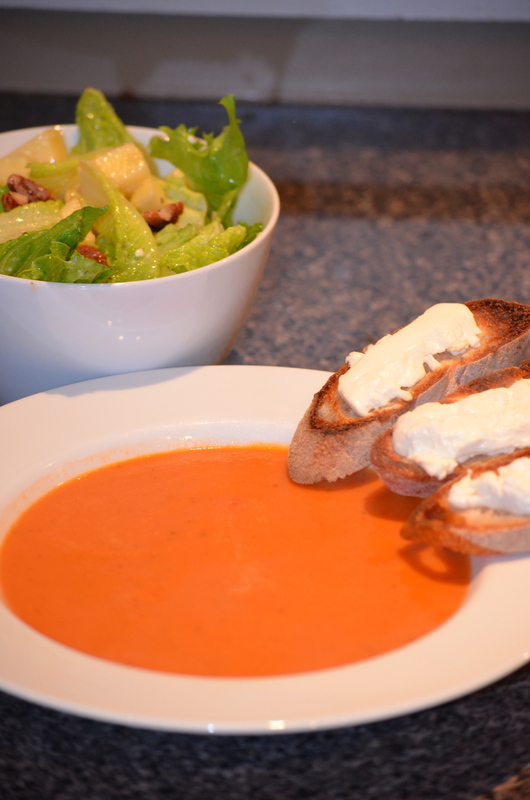 Transfer the soup into a large bowl so the dutch oven you’ve been cooking in is now free of tomatoes etc. Carefully puree the soup base in batches and add back to the dutch oven (via sieve if you so choose) so you can bring it back to a simmer right before serving. Relatively important: In order to keep your blender from exploding, remove the little plastic bit from the lid of your blender so there’s a hole for steam to escape. Grab a dish towel that you don’t mind ruining and use that to gently cover the top of the lid. Now you can puree. This way, the steam building up inside has a way to escape through the opening/towel rather than building up and shooting the lid off the blender across the kitchen. Once you’ve pureed everything and it’s back on the stove, fix up whatever you want to serve with it. 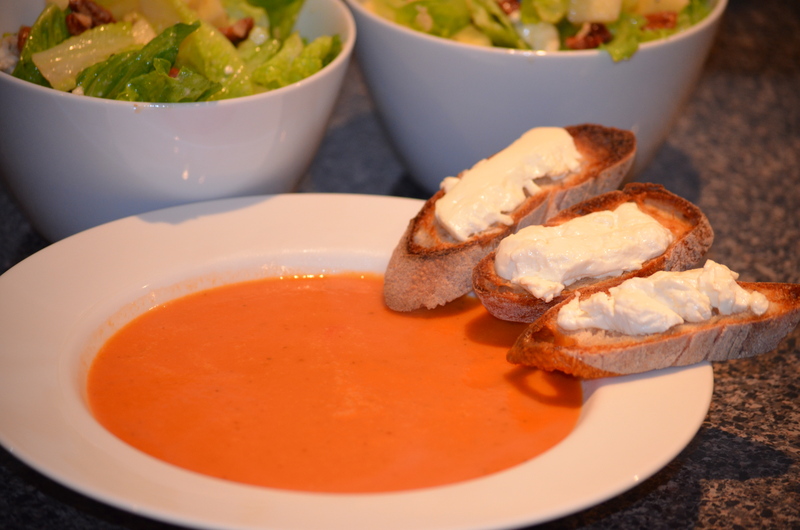 Grilled cheese goes well, a salad too, tartines (shown above – little toasts with goat cheese on them) and some would even say you could serve this with A FRICKING HOT DOG. It’s up to you. (so tell those nosy people just to stay the hell back).